Tikigirl - Colorado Great fit! "I just bought this jacket and it is a perfect fit for me. 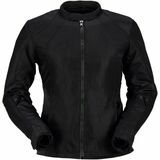 Great price, slim look, and feminine without risking any safety features. Only thing this jacket doesn't have is the back protection pad, but the insert space is there. I bought another brands insert and it fit perfectly! I was meant to find this jacket and deal."